Say goodbye to multiple 3 ring binders, suitcases full of books, and time wasted trying to find that song that you need. iGigBook manages all of your PDF sheet music resources; real books, fake books, chord charts that transpose, single sheets of music and full blown scores. All of your music at your fingertips, in real time, on any gig. Designed by gigging musicians for gigging musicians, iGigBook features a powerful search engine that lets you instantly find the one song that you need among the thousands contained in your sheet music collection. Show up to any gig confident that when the tune is called, you'll have it ready while others fumble and flip through pages. iGigBook works like the powerful search engines that you've used for finding stuff on the web. Start typing in the name of a song and search results from over 70 books appear so that you can choose the best arrangement that you have available. Only iGigBook can allow you to find, in seconds, all versions of "Autumn Leaves" or all of the songs by Antonio Carlos Jobim. Now is the perfect time to get your hands on the perfect jam session tool and the only app that allows you to find in seconds that needle in a haystack tune buried deep inside your vast sheet music collection. â€¢ Integrated metronome with tap tempo and rhythm patterns. â€¢ iPad Pro ready, view 2 pages side by side in landscape mode. â€¢ Over 70 fake and real book indexes makes searching a breeze. â€¢ Import PDF files from iCloud, Dropbox and Google Drive. â€¢ Add notes to any score, highlight repeats, D.S., D.C., Coda, etc. 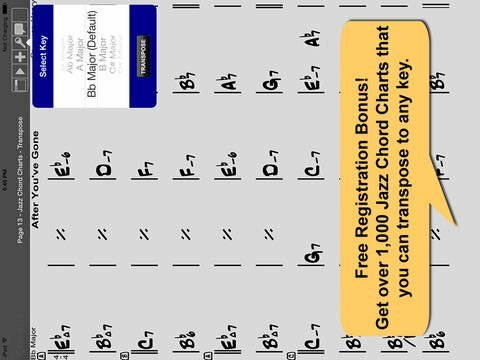 â€¢ Transpose between Bb, C, Eb and Bass clef versions of the same PDF. â€¢ Manage scores of any size, 1 page to thousands of pages. â€¢ Quickly locate the song you need by typing in the title. â€¢ Looking for all of the tunes by Miles Davis? iGigBook can find them! â€¢ Powerful Set List Manager lets you create, arrange, sort, combine and rename. â€¢ Email set lists to band members and include a PDF of the songs in the set. â€¢ Print a hard copy via AirPrint, of the music contained in a set. â€¢ Import bookmarks present in your PDF documents. â€¢ Send MIDI commands to your MIDI devices from any page. â€¢ Turn pages hands free with an iPod 5th Gen/iPhone 4S or greater. iGigBook DOES NOT PROVIDE PDF BOOKS FOR DOWNLOAD. Got questions? Ask them before you buy. If you're not sure what this app does or whether or not it will do what you want, visit forum.igigbook.com and ask questions, we will help you.